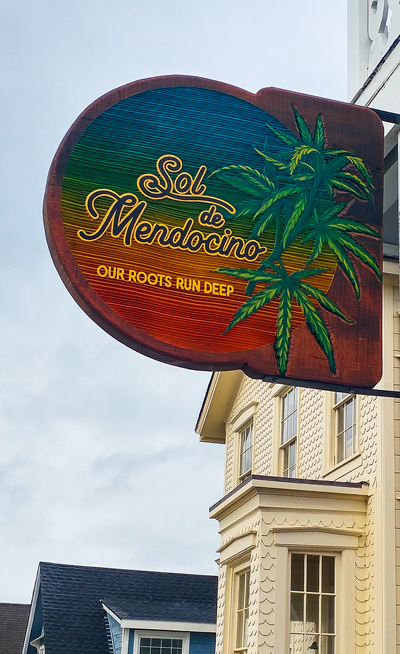 After almost eight years, we’re changing our name to Sol de Mendocino, but we’re Keeping the Love In It! We have moved to our beautiful new location! Check out our new on-line Menu where you can see what’s in stock and place an order for in-store pick up. Welcome to SOL de MENDOCINO / Love In It. Located in the heart of Mendocino Village, our dispensary, Love In It, opened on February 14, 2011. We are transitioning to a new name, SOL de MENDOCINO, to highlight our emphasis on sun-grown cannabis cultivated using sustainable and organic methods on our farms—Chorus Frog Farm and Philo Pharms in Mendocino County’s beautiful Anderson Valley. On this site, you’ll find links to our current menu, resources for patients, and photos from our fields. Throughout our website, you will see photos from our farms, from previous growing seasons. We don’t stock all strains at all times. Please check our Menu for current availability.